I’ve enjoyed Erdrich’s books ever since The Beet Queen in 1986. I read Love Medicine, her most famous book – her first book – later – like only a few years ago and I’m a fan – usually, not every book lives up to the wonder of Love Medicine. With Love Medicine, Erdrich created a community in northern North Dakota on and near the Turtle Mountain Reservation in a way similar to Faulkner’s community in Yoknapatawpha, Mississippi. The other stories mostly all have something, in some way, to do with the families and others who live on the Reservation. 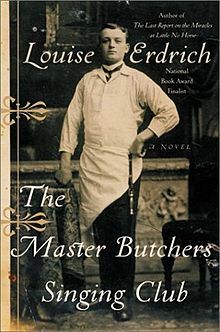 The Master Butcher’s Singing Club takes place in a small town just south of the Reservation and there is a character named Cyprian Lazarre there – Lazarre is a common family name in the Reservation community. But instead of being about Natives and their relationships to each other, the land, their old ways, the new ways, etc. The Master Butcher’s Singing Club is about the German immigrants in the town of Argus, North Dakota in the years between World Wars I and II. IN that way this is historical fiction – presented in the way of most of Erdrich’s novels – the “outside world” has an impact even though the families are very rural, almost remote. Fidelis Waldvogel immigrates to the US after the Great War and settles in Argus where he opens shop as a butcher. He marries his buddy’s finance and acts as father to her unborn child (his buddy’s). They have three more boys. Meanwhile, Delphine Watzka, a young polish immigrant cares for Roy, her alcoholic father, and falls in love with Cyprian Lazarre, a traveling performer. The only thing I had a problem with was Erdrich’s narration and this is really the reason for the lower rating. In general, it’s not a good idea for authors to read their own works and this is no different. Erdrich loves these characters and it shows, she reads so lovingly, so gently, but her voice is way too soft. I had to jack up the sound to maximum power and it was still soft. This is not an intimate bookstore reading, which Erdrich does a lot of . Also, I think there’s a problem with the technical stuff – the quality is uneven. Over the course of decades people get to really know each other, fall in love, die, go on even with the pain. The book is about love and loyalty and loss and changes.